why its important to rank on highest positions on big G? Why is really important to rank on #1 spot on Google Search Engine? If you go to the Search bar on Google and enter the words "SEO for Small Business". You are getting the following data:170 mill search queries for that phrase and monthly volume search of 1.3k with average CPC 22$ per click. I use one quick neat Google Chrome extension which you can see and it's awesome. I just use values as a reference because sometimes because delay there are not accurate so must make own due diligence to figure out how strong/tough is your niche and what are real numbers. 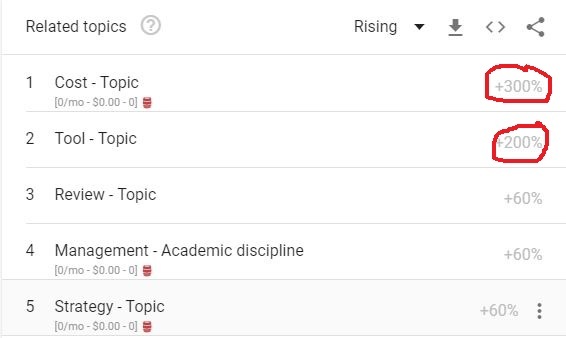 Next when you get on Google Trend for the particular keyword "SEO for small business" you will notice that is not the best period of "trending" of that particular keyword. Why is that is full another story which I will write full and in depth to understand why some keywords who have higher commercial intent are not so much searched over one year Next Time. But this is not true for all regions or particular city which I call them megacities as New York, London, Paris, Los Angeles or particular states as California let say in the USA. Ah let back to results. So let's unwrap the calculations. Lets back to see what at real numbers. In this case, the target is the USA. This keyword as I know perform 100% trend in several, or at least in one or two sub-regions. Here are the trends in sub-regions. This means that in the current state of 20% trend Google shows us that the keyword has monthly volume searches 1.3k exactly. In the highest trend in the USA in all total 12 sub-regions if number 1.3k is overall this means that total monthly volume searches are 6.5k for that particular keyword. From the following image, we can determine what is the intent of the keyword. And as you can see in the image the projected way is that in the near future will increase and the intent of keyword is the cost. Every SM's seek an answer to the question "How much will cost me SEO for my small business?" which rightfully shows the commercial intent to buy that service. Now, someone will say that my numbers are wrong that the trend will tell us that 20% from 1.3k is exactly number so its come to a number of 260 monthly volume searches and 100% trend in New York with millions of small businesses who seek SEO help or services. Yes, maybe if I obey on data that Google will serve us. I'm talking about data which I pull from my own experience and huge knowledge about SMB's, especially in the USA. Finally to see how is data in the worldwide picture. Its show about more than 40% trend and signs that this keyword monthly volume searches over time will increase. Now we are sure that at least in the moment we have 6.5k monthly volume searches. over 80% of people on Google Search Engine don't click on paid ads on big G, unless if you seek fast and emergency solution as a plumber, construction company and so on. only 3% belongs to #3 spot on Google search engine. In this situation is quite obvious in distribution over the clicks that my number of 6.5k is more likely to be more real than 260 clicks per month. So let do the math. #3 spot get only 195 clicks. This is why everyone fight to rank on #1 spot on google and not just for this keyword but also for many other keywords which are known as Long tails keywords trough you can also accumulate traffic and are also with the same intent of the keyword which we took as an example. We begin new working relationships by evaluating your digital marketing goals. This way we can ensure that they align with the strategy that will be implemented down the line. This is the portion of the on-boarding process where we will work together to fully grasp the market a company is trying to target and reexamine its target customer profiles. This is important to align with the evaluation of the company’s messaging strategies, including which types of message are best performing with their audience. If you have switched from another internet marketing company and have active campaigns, this is the time where we evaluate what we can do to improve those results. This includes finding out which keywords are performing and which are not in a PPC advertising campaign. The communication between the company and the designated account manager during this time is crucial to establish the long-term goals that we are putting in place. Competition research is done to gather information that is needed to make informed business decisions such as those surrounding products, prices, placement, and promotion. This research helps to build an accurate picture of the market you’re working within, and to see what elements are working for your competitors. By doing thorough industry research on every new client, we can evaluate the company’s value and its future performance. This business valuation requires a great attention to detail. We perform industry research to identify what the leaders in your discipline are doing to succeed and how that differs from your current digital marketing efforts. Without a clearly identified target audience, you are essentially throwing your money away. And we’re not going to let that happen. When you are one of our clients, we research and create buyer personas for your business. This will focus our digital marketing efforts and the increased number of leads your business receives will be proof of its effectiveness. Based on the previous steps, we take our strategies and implement them into our overall digital marketing efforts. This involves putting the marketing design, execution and scheduling into development. Timelines and specific tasks will be given to our core team to ensure work is done right and on time. During this step, we will be in communication as approvals are needed and/or required from you, as well as progress updates to keep you informed of our efforts. We also establish a system for tracking and monitoring the strategies; schedule monthly meetings with established methods of the reporting process; and establish a performance management system. We monitor the implementation process closely since we know that, at some point, we will need to make necessary modifications to maintain growth. Measurement is crucial to any company’s growth. If measurement and tracking tools aren’t implemented, there is no way of knowing whether a strategy is working or not. We are a results-driven best SEO Toronto company that utilizes this collected data to optimize our strategies to their fullest potential. Besides being one of the Top SEO Toronto and Internet Marketing Toronto company, we utilize tools that can measure the following: Number of calls and conversions through a PPC advertising campaign Reach, interactions and impressions on shared social media content Bounce rate, time spent and engagement rate on your website Where visitors are spending time on your website and what they are clicking on With the data collected, we are able to strategize elements of your digital marketing to increase the results and, ultimately, the leads that your company is receiving. With the data collected during the measurement and tracking stage, we are able to constantly optimize and adjust whatever is required to achieve the results that we have promised to our clients. We stay true to our word when we guarantee our clients leads and optimization is a key tactic that we use to make sure that happens. For example, our PPC team is constantly monitoring and optimizing Google and Bing ads to make sure that only relevant keywords are being searched when the advertisement appears at the top of search engines. The team also rewords ad campaigns so that the campaigns will gain more attention than the competitors’ ads that are fighting for the conversion. Once we have the initial data collected, we are consistently in the optimization stage. This means that we are constructing and executing new strategies, receiving the data-based results, and, once again, strategizing new ways to increase the impact of a certain digital marketing service. This step is crucial to the overall success of every digital marketing strategy. Scaling is the process of getting rid of the past strategies that aren’t going to get you the results that you want. The digitial marketing companies who don’t use the scaling process are essentially wasting their money and lowering the return on their investment. An example of scaling would be with social media platforms. If your company had social media profiles on Facebook, Twitter and Instagram, and Instagram wasn’t performing how we originally anticipated, we would change our efforts into another platform like LinkedIn to see if there was success. The truth is, every social media channels is not for every company, so it takes time to determine which platforms work and which do not. The reason to scale on particular services is to guarantee that our focus and your money are working the best for you. We are in the business of making the most out of our clients’ investments, and this tactic is the way we make sure that happens. Email marketing keeps your prospects aware that your company exists and that it should be their number one choice for the particular product or service your company is offering. The key aspect of email marketing is the concept of segmentation. When we develop an email marketing series, this is the first thing that we do in order to develop personal and customizable messages for your targeted audience. The desired action of the email marketing campaign also needs to be determined. Are you trying to convert the prospect into a client? Are you using it as a client nurturing tool? Or, are you looking to sell your products? Whichever intention you may have, Edkent Media has the expertise to reach your goals. And with the use of marketing automation, the process couldn’t be simpler to understand and use. There is no guess work in email marketing. We are able to track who opened your email, which links were clicked and how many recipients unsubscribed. This allows our A/B testing to have comparable data that can be learned from and improved upon. Do you need a professional website?